The U.S. Environmental Protection Agency (EPA) has proposed to designate a dredged material disposal site to serve the eastern Long Island Sound region. The Eastern Long Island Sound Disposal Site (ELDS) would be located offshore from New London, Conn., and would be available for the disposal of dredged material from harbors and navigation channels in eastern Long Island Sound in the states of Connecticut and New York. 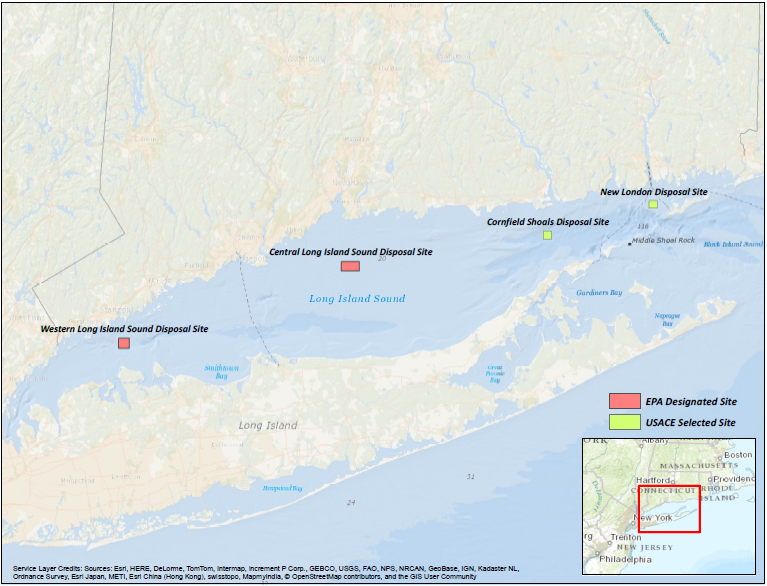 EPA is proposing the same restrictions on the use of this site as it proposed for the central and western Long Island Sound disposal sites, to support the goal of reducing or eliminating open-water disposal of dredged material in the Sound. These restrictions are intended to promote the beneficial use of dredged material, such as beach nourishment, or other alternatives to open-water disposal whenever practicable. The proposed action is described in a draft rule and Draft Supplemental Environmental Impact Statement (DSEIS) that also is being released today for public comment. These documents are available for public review and comment until June 27, 2016. EPA will hold two public hearings on the proposed rule on May 25 and 26. The DSEIS is considered supplemental because it updates and builds on analyses that were conducted for the 2005 Long Island Sound Environmental Impact Statement that supported the designation of the Central and Western Long Island Sound dredged material disposal sites. The DSEIS recommends designation of the ELDS as the preferred alternative from the range of options considered. 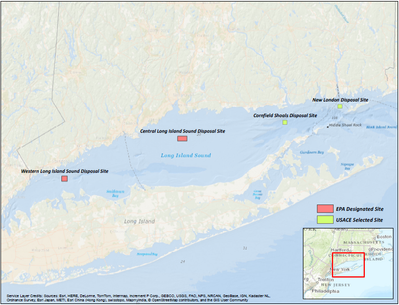 EPA determined that a site was necessary because there are currently no disposal sites designated for long-term use in the eastern Long Island Sound region, the dredging needs exceed the available capacity at existing sites, and the regulations require EPA designation for any long-term dredged material disposal site. The U.S. Army Corps of Engineers (USACE) estimates the dredging needs in eastern Long Island Sound to be approximately 22.6 million cubic yards over the next 30 years. While EPA, the USACE, and the states of Connecticut and New York are committed to developing and promoting the use of alternatives to open-water disposal, EPA has determined that an open-water disposal site still is necessary in case an alternative is not available for some projects. Periodic dredging of harbors and channels is essential for ensuring safe navigation and facilitating marine commerce and recreation. The designation of dredged material disposal sites by EPA only makes those sites available for use by future dredging projects; it does not authorize the disposal of any material from any project. Any proposal to place dredged material at the ELDS will have a project-specific authorization and must satisfy the stringent requirements of the ocean disposal regulations. Dredged material that does not pass the stringent testing requirements and is determined to be toxic are not, and will not in the future, be placed in the open waters of Long Island Sound. These materials currently and in the future will require either containment or treatment. - May 25, 2016 in New York from 1-3 p.m. at the Suffolk County Community College Culinary Arts Center, 20 East Main St., Riverhead, N.Y., and 5:30-7:30 p.m. at the Mattituck-Laurel Library, 13900 Main Rd., Mattituck, N.Y.
- May 26, 2016 in Connecticut from 1-3 p.m. and from 5-7 p.m. at the University of Connecticut – Avery Point, Academic Building, Room 308, 1084 Shennecossett Rd, Groton, Conn. Following consideration of the comments received, EPA will issue a Final SEIS which will include written responses to comments.